During the National Sexual Assault Conference in August, Prevention Institute’s Annie Lyles presented a very popular session titled, All Communities Are Not Created Equal: Opportunities for a Health Equity Approach Within Sexual Assault Prevention. Discussed in a follow-up podcast, the session explored the ways in which health equity approaches can be applied to, are in line with, and contribute to sexual violence prevention. 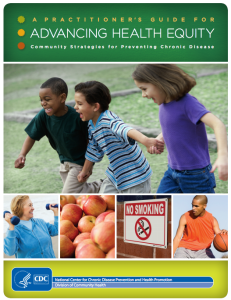 Health equity is the attainment of the highest level of health for all people. Achieving health equity requires valuing everyone equally with focused and ongoing societal efforts to address avoidable inequalities, historical and contemporary injustices, and the elimination of health and health care disparities. The guide makes the all-important link between violence prevention and chronic disease prevention, offering a helpful overview of health equity approaches and examples that can be useful as we explore how to apply the approach to sexual and domestic violence prevention work. After all, a world in which there is health equity is indeed a world without sexual and domestic violence. Visit our blog for more on health equity and sexual and domestic violence prevention. How have you used health equity in your prevention work?